It is a rare disease which has changed within the last 30 years from being invariably fatal to a disorder for which there is effective surgery to relieve symptoms or curative liver transplantation, or both. It is a life-threatening condition in infants in which the bile ducts inside or outside the liver do not have normal openings. Three centres in the UK have expertise in the operation, Kings College Hospital, London, Birmingham Children's Hospital and St James' Hospital, Leeds. Biliary atresia is due to loss, or atresia, of the bile ducts responsible for draining bile from the liver. It is not clear how or why this occurs and may be due to a problem in the developing embryo (10-20 per cent) or around the time of birth (80-90 per cent). It occurs more often in Asian and African-American newborns than Caucasian. Bile is made by the liver and helps with the digestion of fats. If bile is not removed from the liver, it builds up and begins to damage it. The baby will develop jaundice, or a yellow colour of the skin. Other symptoms include dark coloured urine and pale stools. Many babies become jaundiced but lasting for longer than 14 days with other symptoms would raise concerns. The first symptom of biliary atresia is jaundice - when the skin and whites of the eyes turn yellow. Jaundice occurs when the liver does not remove bilirubin, a reddish-yellow substance formed when hemoglobin breaks down. Hemoglobin is an iron-rich protein that gives blood its red color. Bilirubin is absorbed by the liver, processed, and released into bile. Blockage of the bile ducts forces bilirubin to build up in the blood. No single test can definitively diagnose biliary atresia, so a series of tests is needed. All infants who still have jaundice 2 to 3 weeks after birth, or who have gray or white stools after 2 weeks of birth, should be checked for liver damage. A battery of tests are often required to confirm a diagnosis of biliary atresia, as the symptoms can be confused with other conditions. * An abdominal x-ray to look for an enlarged liver and spleen. * A liver scan to determine how well bile is flowing (HIDA or TEBIDA). * A liver biopsy to determine degree of cirrhosis or to rule out other causes of jaundice. * Diagnostic surgery. If the test results suggest biliary atresia, an operation is performed to examine the bile ducts and an x-ray is taken during the operation to determine whether the bile duct is blocked. The earlier biliary atresia is detected, the less damage it will have done to the liver and the better the chance of a successful outcome to treatment and the current target is to treat babies before they are eight weeks old. The condition is treated through an operation called Kasai-portoenterostomy. This involves using a loop of bowel to form a duct to drain the bile from the liver. The operation is named after the Japanese surgeon, Professor Morio Kasai, who developed it in 1959. It was first introduced in the UK in the 1960s. The operation is extremely intricate and is best carried out in a centre with expertise in this area. Operations can be carried out on children as young as 11 days old. Where the Kasai procedure is successful, 80 per cent of children have their own livers at ten years old with a good quality of life. The Kasai procedure, named after the surgeon who invented the operation, is usually the first treatment for biliary atresia. During a Kasai procedure, the pediatric surgeon removes the infant's damaged bile ducts and brings up a loop of intestine to replace them. 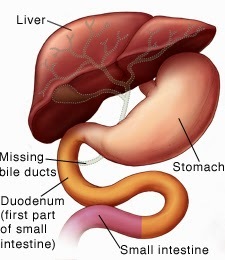 As a result, bile flows straight to the small intestine. While this operation doesn't cure biliary atresia, it can restore bile flow and correct many problems caused by biliary atresia. Without surgery, infants with biliary atresia are unlikely to live past age 2. This procedure is most effective in infants younger than 3 months old, because they usually haven't yet developed permanent liver damage. Some infants with biliary atresia who undergo a successful Kasai procedure regain good health and no longer have jaundice or major liver problems. In years past, the size of the transplanted liver had to match the size of the infant's liver. Thus, only livers from recently deceased small children could be transplanted into infants with biliary atresia. New methods now make it possible to transplant a portion of a deceased adult's liver into an infant. This type of surgery is called a reduced-size or split-liver transplant. Part of a living adult donor's liver can also be used for transplantation. Healthy liver tissue grows quickly; therefore, if an infant receives part of a liver from a living donor, both the donor and the infant can grow complete livers over time. Infants with fetal biliary atresia are more likely to need a liver transplant and usually sooner than infants with the more common perinatal form. The extent of damage can also influence how soon an infant will need a liver transplant.